The East Texas Sacred Harp Singing Convention is an a cappella shape note singing from a songbook entitled "The Sacred Harp." 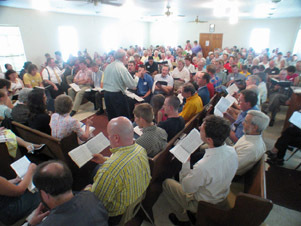 The East Texas Convention, founded in 1855, is the oldest singing convention in Texas and the second oldest continuous Sacred Harp singing convention in the United States. Singers from many U.S. states annually descend on Henderson, Texas for this special event.